Despite launching back in March the 141,000 gross ton Britannia has only now just completed her maiden British Isles voyage. 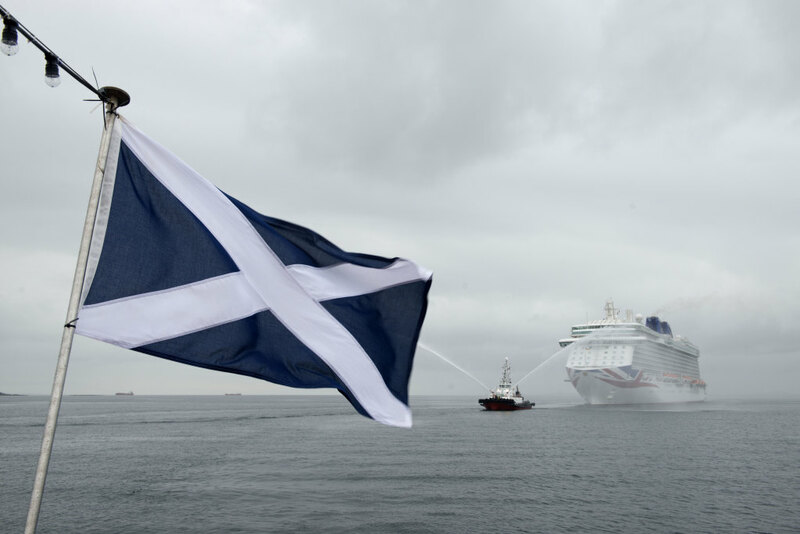 The 12-night voyage aboard P&O Cruises’ flagship vessel, dubbed a ‘lap of honour’ in celebration of all things British, departed Southampton on 6 July. En-route to her first port of call in Edinburgh the ship sailed past the sheer white cliffs of Flamborough Head on the Yorkshire coast as well as the Magnesian Limestone cliffs near South Shields in Tyne and Wear. In Yorkshire a large crowd had formed in Scarborough to wave to the ship as she cruised past. The county has strong ties to Britannia with Wold Top Brewery, Acorn Brewery and Timothy Taylor each supplying the ship with beers and ales, while Scarborough-based Qdos Productions has supplied performers and dancers for the entrainment on the ship. In Tyne and Wear the ship sailed past Souter Point at around 8pm, Lizard Point at 8.15pm and the mouth of the River Tyne at 8.30pm. Next she received a warm welcome to Scotland, anchoring in deep water off Newhaven with regular 20-minute tenders ferrying passengers to and from the harbour. Britannia’s arrival was only made possible following significant investment by Forth Ports in dredging and deepening the seabed. 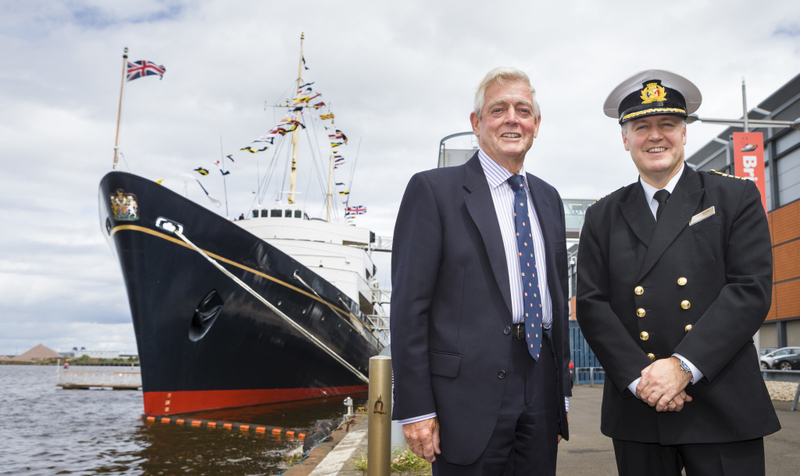 Edinburgh’s Deputy Lord Provost Steve Cardownie visited the ship and presented Captain Paul Brown with the Edinburgh crest and a bottle of single malt whisky. In return, Counsellor Cardownie received the ship’s crest for display in the City Chambers. While tendered off Newhaven passengers had the opportunity to visit Royal Yacht Britannia which was berthed nearby. The second port of call was Invergordon with excursions offered to Inverness and to attractions including Loch Ness, Dunrobin Castle, Glenmorangie Distillery, Cawdor Castle. The Invergordon Music and Dance Group entertained passengers on-board in the evening on the Lido Deck followed by a performance by the Dornoch Pipe Band from the quayside as the ship departed at 10pm. Kirkwall was the third port of call on the itinerary. The visit came in the middle of a successful cruise season for Orkney with 2016 promising 100 cruise ship visits across the season, delivering Orkney’s 750,000th cruise passenger and a total of 1,500 cruise ship calls since 1992. After sailing past Cape Wrath, the most north-westerly point of the mainland United Kingdom, Britannia headed on to Greenock. The ship towered over Gourock as she headed for the port. 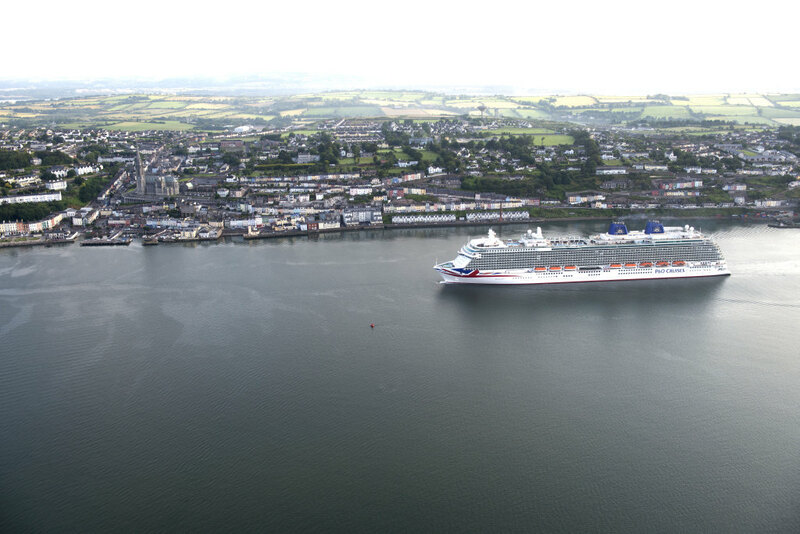 The ship’s arrival came during a record-breaking year for the port, with Greenock set to become the first Scottish port to welcome more than 100,000 passengers in a year. Excursions were offered to Glasgow as well as to attractions including Inverary Castle, Glengoyne Distillery and Loch Lomond. Britannia then headed back to England with a call at Liverpool. Mid-river fireworks took place at around 10.30pm to mark the departure of the cruise ship. She then crossed the Irish Sea to call at Dublin port instead of the scheduled anchorage call off Dun Laoghaire Harbour. With assistance from a pair of tug boats the 330 metre-long ship had to be turned 180 degrees to enter the port astern. Following the call into Dublin Britannia next called at Cobh in County Cork. On her way to St. Peter Port in Guernsey Britannia cruised by South Cornwall, passing Lizard Point at around 5.45pm, Black Head at 6.30pm, and Falmouth Harbour at 7.30pm. From the Channel Islands she headed back to Southampton arriving on Saturday morning and completing her maiden British Isles voyage. On-board this particular sailing was the ‘Food Hero’ James Martin who was also accompanied by celebrity chefs Mary Berry and Theo Randall. 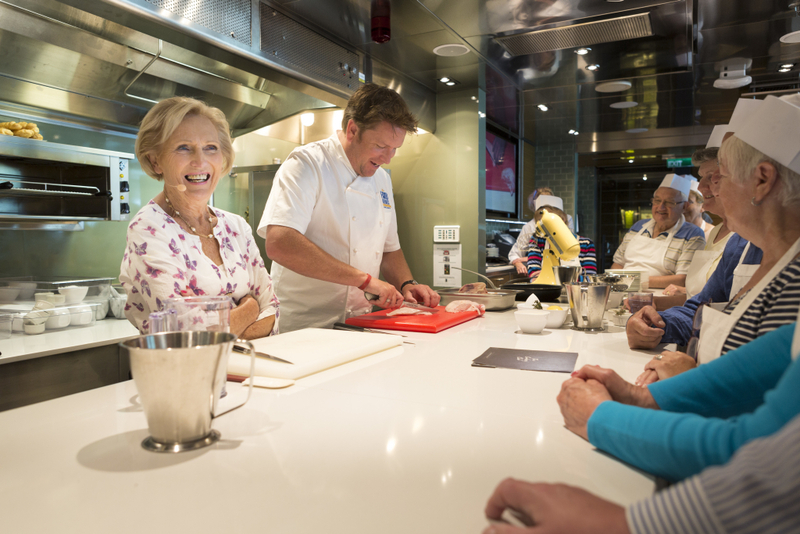 Passengers enjoyed a unique opportunity to learn about the careers of the celebrity chefs in a Q&A session while select passengers who had pre-booked enjoyed a hands-on cookery lesson or an intimate hosted dinner. 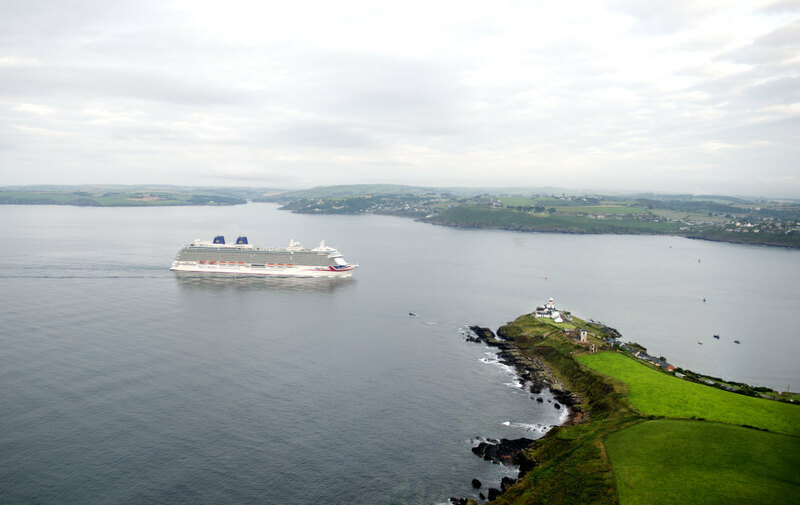 No further British Isles voyages have been pencilled in aboard Britannia for the foreseeable future, although a similar voyage is planned for 2016 on P&O Cruises’ Oriana.